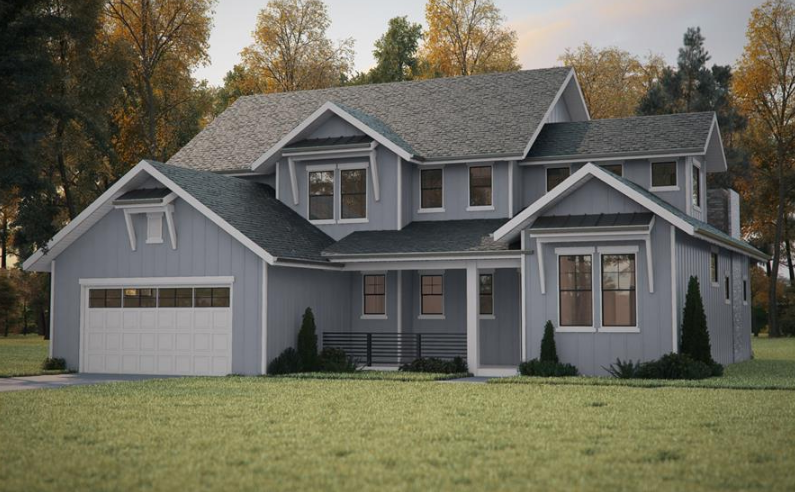 So you’ve practically fallen in love with one of our house plans. Everything about the house is essentially perfect — from the number of bedrooms and bathrooms to the visual aesthetic. The only problem? You wish you could reverse, or “flip,” the plan. If this sounds like you, you’re in luck. The Plan Collection offers options to reverse house plans to create an exact “mirror” image of the original floor plan. What is a Right-Reading Reverse House Plan? A right-reading reverse house plan, also known as a reverse house plan, is a plan that is a “flipped,” or reverse, image of an original plan. This puts the right side of the home on the left side and the left on the right. These main-level floor plans for the home shown in the photos at top (as designed at left and flipped at right) show what the layout of the home plan looks when flipped (right). When you order right-reading reverse (explanation below), the numbers and letters will be readable and not reversed (House Plan #161-1087). 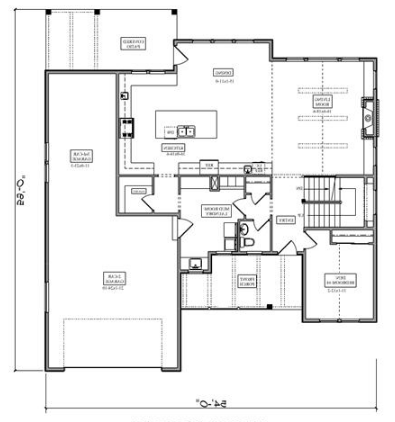 Oftentimes, people confuse right reading reverse home plans with mirror-image house plans. With mirror plans, the designer does not take the time to correct backwards-reading letters and make all of the words and numbers readable. To use these mirrored plans, you have to purchase at least one set that is not mirrored, just so you can refer to the readable version to understand the plans. This gets a little old and tedious fast. If you ask anyone who has built a home using the mirrored fashion, they most likely would never do it again. The good news is that, for an additional cost, you can order right-reading reverse plans from The Plan Collection. This means that the designer will go through and reverse the plans but also will make all of the writing readable. This is a great option that costs a bit extra, but it makes building the house much easier. It typically takes our designer 2 to 4 business days to deliver a right reading reverse house plan. As an example, take a look at Plan #106-1274. (Clippings from the plan details page are shown above.) 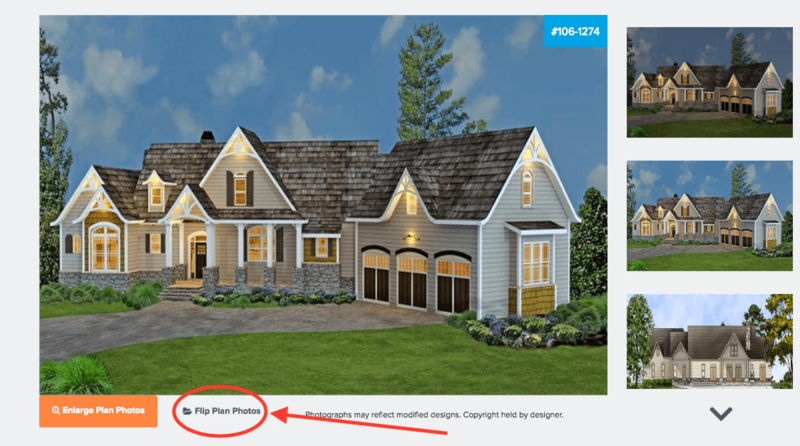 Next to the “Enlarge Plan Photos” option, you can click on “Flip Plan Photos” to view a mirror image of the same plan. If you like what you see and you want to order a right-reading-reverse version of that plan, you can do so in the “Select Optional Add-Ons” section of the order form. 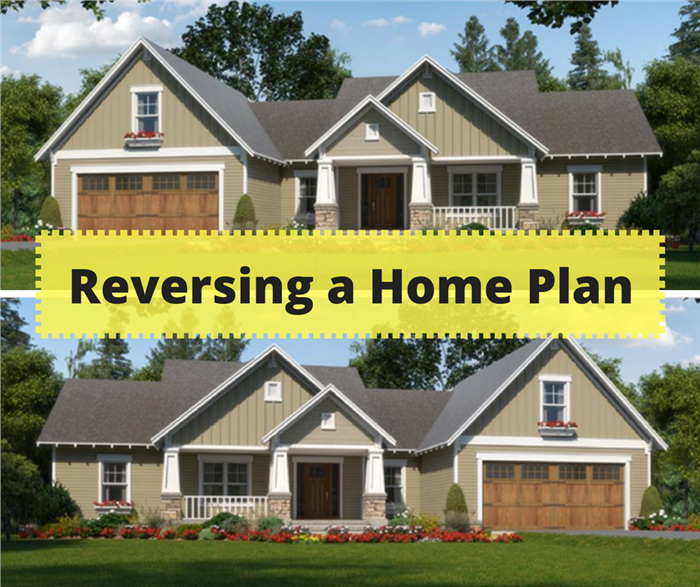 Why would someone want a reverse home plan? 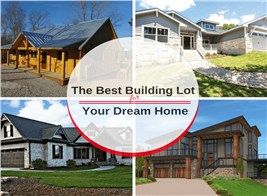 It could be due to a number of reasons, including legal specifications or zoning purposes. 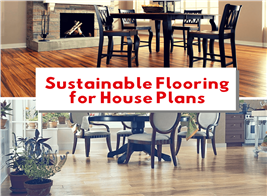 Many times, people simply want to reverse house plans due to personal preference. 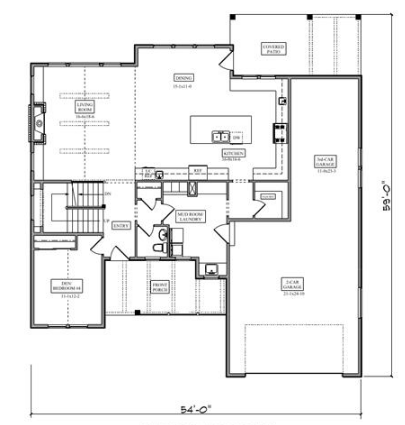 No matter the reason, you can find reverse house plans at The Plan Collection. 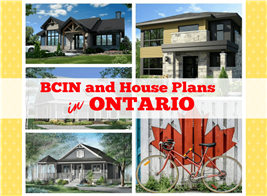 You can preview each of these plans and their corresponding photos to understand what the house would look like reversed. If you’re satisfied, you can then order a right-reading-reverse version to make the construction process much more streamlined. Please note that the right reading reverse option is not available for all house plans. Have questions about reversing a plan? Contact us today and our team of specialists will be happy to help you find the perfect home plan for your needs. Footnote: the lead image for this article is of two versions of a 3-bedroom, 2.5-bath Craftsman style home plan – as-designed and reversed. 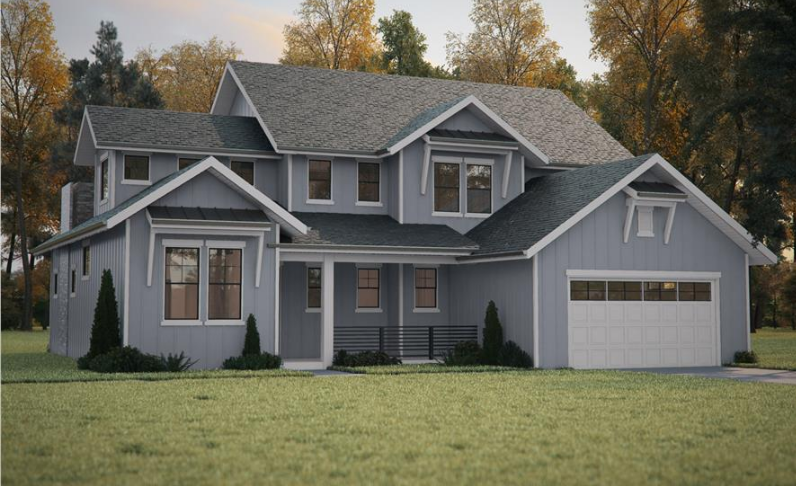 For more information on the plan, click here (House Plan #141-1298).